"What a splendid place to spend family holiday! We swimming in the pool, reading books in the sun, playing ping-pong tournaments or just enjoyed the silence! A great experience for all of us." B. family, from Germany. "Having returned for a second visit after 10 years, we had another lovely sky. The house has changed and yet not changed!" D. family, from UK. "We returned to this beautiful house with great pleasure. We had fun in the pool. We canoed down the river from Chenaud to parcoul - what an adventure! We dined at Chenaud and Aubeterre to spnanish guitars and flamenco dancing. We had a relaxed BBQ at home. We visited the Chateau de la Rivière at Fronsac - well worth a visit." The S., R. & W. families, from UK. "A wonderful holiday for three generations from 16 months to 66 years. Our weather was mixed and enabled us to get out and about when not lazing by the pool. We spent a wonderful "fête des pères" tasting wines at the salon du vin in St Emilion - two quite merry fathers!! The little train was a wonderful way to see the sights. Our second visit to Manoir de Puymangou did not disappoint. All was as good as we remembered." P. Family, from Ireland. "A wonderful time had by all. Felt at home from day one! Just wish we had 2 more weeks!" W. & B. C.
"Puymangou had all the ingredients for a perfect vacation. We've spent a wonderful two weeks alternating between relaxing, lazy days and enjoying garden meals, and the rest of the time exploring the Dordogne, Charente and Gironde. We'are also very grateful to have had the chance to meet you in person, and to get all the good recommandations for our trips and dinners. We had the best foie gras of our lives at the restaurant you recommanded! We hope to be able to come back to Puymangou soon. C'Ã©taient des vacances tranquilles dans un paysage beau et une maison exceptionnelle" The R. family, from Austria. "Wonderful relaxing time in a beautiful spacious home. The space in the manorhouse and garden is a great asset. A fine base for exploration far and wides." The F. family, from Australia. "We will definitly recomend this beautiful place to our friends." The S. family, from Netherlands. "We've had a great two weeks in this lovely manor. We've been so lucky with the weather. The pool was a god-send. - Chalais market on Mondays - nice cheese man! - Lunch and underground church in Aubeterre. - Day out to St-Emilion - beautiful town. Great views from the top of the clock tower. - Treat yourselves to diner at Le Château Le Mas de Montet near Aubeterre : lovely food and ambiance. - Spend a day kayaking from Parcoul - a beautiful way to see the scenery. - Hire VTTs from the same places - lots of great routes round here. It's a beautiful part of the world and we've had a great two weeks exploring it." (September) M & N, L, M, S & E the dog! from UK. "We've had a lovely two weeks in the manoir. Périgueux was beautiful, Angoulême and Périgueux good for shopping - Markets in Chalais and Ribérac great fun. Swimming by the river on the "beach" in Aubeterre and St Aulaye - the kids loved it. Beaches at Royan lovely but a bit far away! Good café in Aubeterre by the "black cat" in the square and the ruins are a must. Very relaxing holiday for everybody." (June) R. Family. "We've had a wonderful holiday in your beautiful and peaceful chateau. We have enjoyed the pool, the table tennis, the gardens, the house and church nearby. Between us we have been cycling, fishing, canoeing, golfing, horseriding and walking. We also visited Cognac, St-Emilion & a local producer of Pineau and villages nearby! We have had cloud, an electrical storm and lovely sunshine - all in one week. "A wonderful 2 weeks spent relaxing by the pool, playing table tennis and badminton. 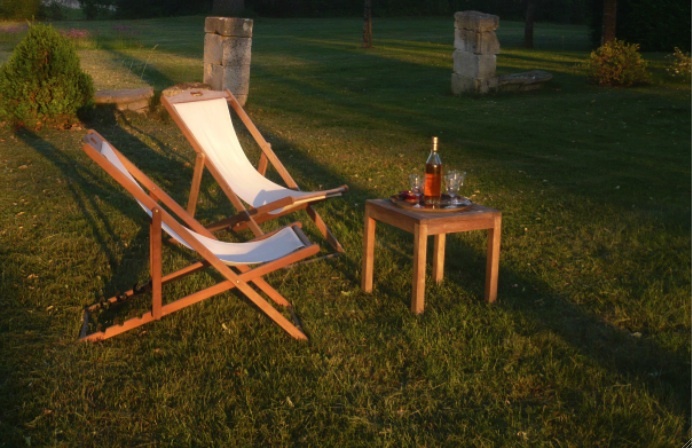 Visiting Cognac, Sarlat, Bergerac + Riberac + canoing from Parcoul. The weather has been glorious and enabled us to enjoy the beautiful countryside and charming gardens of the chateau. C'est très très bon." The S. family. - St Emilion : smart, picturesque, excellent visit. - Aubeterre sur Dronne : more burrowing Marks. - Chateau Franc Mayne : interesting private visit, beautiful expensive wine. - Remy Martin : professional presentation, children loved the train." "Thank you for making our stay in Puymangou so comfortable. We've had a wonderful first holiday with our 4 month old son. We will definitely be returning. So, here's to the next time..." M, S & T C"